Are you suffering from water or flood damage in the Norco area of Riverside? Don’t try and fix the damage yourself, call the professionals at Superior Cleaning and Restoration Inc. to handle all of your water damage restoration needs. North Corona can be a hot place, but water damage can occur anytime, anywhere. We work with you from beginning to end. Our specialists are trained in all aspects of damage restoration, from dry out remediation, all the way to reconstruction and remodeling. We are available for your water remediation emergency every day of the week, every hour of the day or night. We work with many major insurance companies to accommodate your specific situation. Can you help with flood damage? Flood damage is one of our specialties. It is more common than most people think, and that is why there is insurance to help prepare for such an event. Superior Cleaning and Restoration Inc. understands the stress involved with enduring flood damage. When such disasters occur, it is important to deal with professionals to make sure the job is done right. We work with many major insurance companies and make sure that the work will be completed in a timely manner so you can return to your life without worry. Is water damage that big of a problem? Any amount of water damage can add up to major problems in any manner of time. A small crack in a pipe that leaks for over a year could lead to a major mold problem that spreads throughout the drywall. Superior Cleaning and Restoration Inc. can find and fix any water damage on your property. We pride ourselves on our experience and superior performance. Don’t stress about flood and water damage in Norco, California. 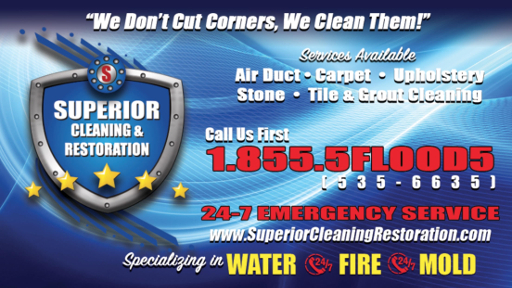 Superior Cleaning and Restoration is here for your emergency service needs. Our trained, professional cleaning technicians can help you throughout the entire process, and we accept many major insurance companies. We will work with you to get your property to a superior state.